The Queen Gull radio controlled target boats were commissioned by the Coast Branch of the Royal Artillery, in order to train crews of the twin 6 Pounder (and sometimes the 12 Pounder) gun batteries in defence of harbour entrances against fast German motor torpedo boats or motor gunboats, and although they could not match the speeds of the latter, they were smaller and very maneuverable, and made very elusive targets for the gun layers. 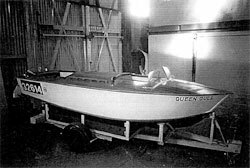 The British Power Boat Company designed and developed the boat to a War Office specification, and 121 were built at their Marchwood Park Facility, up to 1943. The 12' 6" hull was built mainly of plywood but had a hard chine bottom with coarse linen sandwiched between the double diagonal mahogany planking. Under the topside the upper third of the buoyancy chambers were packed with "Onozote", a buoyancy material to prevent sinking if the watertight compartments were punctured. There were 13 such compartments, being separated by the plywood partitions. The boat was powered by a Ford 10 "C" Industrial Unit which gave a straight drive to the two bladed bronze 9½ inch diameter propeller - there was no gearbox - and enabled the unmanned boat to reach speeds of up to 21 knots. There was a four gallon petrol tank which gave an endurance of 2½ hours at full throttle operating at 3,600 rpm. The 12 volt battery powered the starter and Marconi Radio control equipment. The transmitter put out a carrier wave and two frequencies; the carrier wave operated the ignition and starter, one frequency adjusted the throttle via solenoid, and the other operated the rudder via a reduction gear. The operating range of the craft was approximately 3 miles with a normal aerial 15ft high, with the operator located at 10 feet above sea level. Increased operating distances were practicable when the transmitter was located at greater heights above sea level. There was an elaborate cooling system and both the exhaust manifold and the un-silenced exhaust pipe, emerging over the port deck, had water jackets. The whole boat weighed 8 cwt, but rested on wooden-wheeled shore cradles weighing another 2 cwt. The final agreed price to the War Office was £275 per boat, and a draft agreement was made for the production of 110 boats by the end of September 1940, subject to the success of the trials at Hythe in June that year, where maneuverability and unsinkability of the boats were demonstrated before an array of service chiefs. The Queen Gulls became the responsibility of the RASC, but the wireless equipment was maintained with the assistance of the REME. In gunnery practice, by the Coast Defence batteries, the twin 6 Pounder was exercised using either solid tracer shot, or a 2 lb shot, through a sub calibre sleeve inside the barrel with the laying and crew loading drill exactly simulated. With a well practiced crew, the average rate of fire could be 72 rounds per minute spraying an area round the target at a mean range of 2,500 yards. Practice included night drills. This type of training bore fruit when the Italian night raid on Grand Harbour at Valetta was repulsed by the sinking of three 2-man fast motor gunboats by the twin 6 Pounder. Post war, after the shore defence batteries were closed down, numerous surplus Queen Gull hulls were offered for disposal through the Admiralty in the early 1950's.